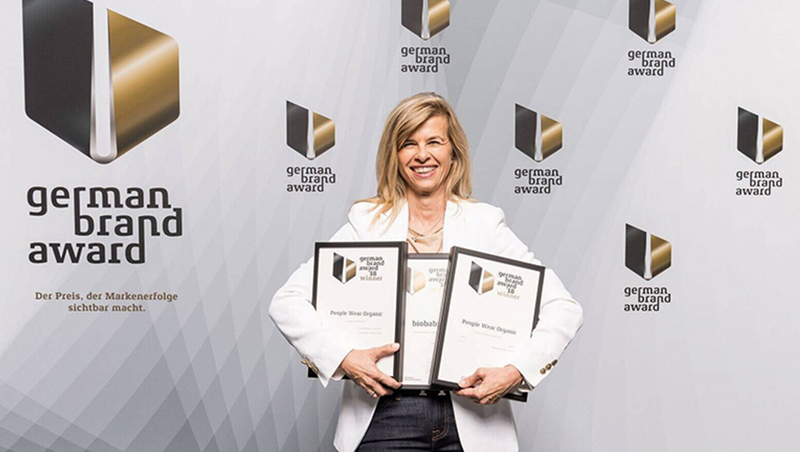 The brands “People Wear Organic” (PWO) and “biobaby“, whose textiles are mainly produced by SEKEM‘s company NatureTex, were awarded three times by the “German Brand Award 2018“: The natural textile brand PWO won in the two categories “Sustainable Brand of the Year” and “Fashion”. And the second brand “biobaby” was awarded with the “Kids & Toys” prize. “We all act out of conviction and with passion. We have a high demand on the style and the long-lasting quality of our products. Together, we define and accompany our raw material, Organic cotton, from the harvest, creating natural textiles that are contemporary in design, of the highest quality and affordable. Today, we came a step closer to our goal of achieving more appreciation and visibility for our natural certified textiles,” said Nicole Pälicke, head of “People Wear Organic”, during the award ceremony on June 21 in Berlin. “People Wear Organic”, originally launched as a natural textile department at the German Organic market “Alnatura”, has established itself as an independent textile company for certified Organic fashion in a very short time. Like SEKEM’s company NatureTex, the German partner company PWO pays great attention to a sustainable and fair production. All of the brand’s textiles are certified by the Global Organic Textile Standard (GOTS). In 2017, the brand “biobaby” had been established by PWO which is specializes in the needs of babies and mothers by offering textiles for breastfeeding, feeding or bathing. The 100% certified Organic fashion of the two eco-brands convinced more and more customers by its consistent sustainable approach, by informative and transparent communication as well as the loving and personal signature and its attention to details. Whether in the food retail trade, in drugstores, baby shops, or online – “People Wear Organic” is currently available at over 400 sales partners; “biobaby” in more than 100 Alnatura-branches as well as in online shops. “In order to know our supply chain from A to Z and to ensure the quality of our materials, we consciously work directly with only a small number of manufacturers. We produce almost exclusively in India and Egypt – where our most important raw material, Organic cotton, is growing,” says Pälicke. One of these longtime partners is NatureTex. Together with “People Wear Organic”, the SEKEM company is very happy about the three coveted awards.